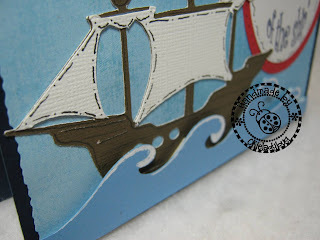 When I first joined the Cricut messageboard we all use to have a lot of fun posting cards and challenging each other with different projects. I had a particular challenge from a certain male who was quite the talented crafter, on making a naughty, yet acceptable card and members got to vote on their favorite. I honestly don't remember who won *okie knows it was her but is gonna be nice about it and cracks up laughin* but I remember the fun we had and how everyone waited for the results of our projects. First off let me give a big shout to the husband of Trinity's Crafting Creation who apparently is one of my blog fans *okie thinks Trinity's husband needs to get a hobby and wonders if he knows the Cricut can cut vinyl and make cool flames for his car*. I know Trinity from the Cricut Messageboard and she talks about her husband starting a blog for men who evidently are going broke because of their wives hobbies. 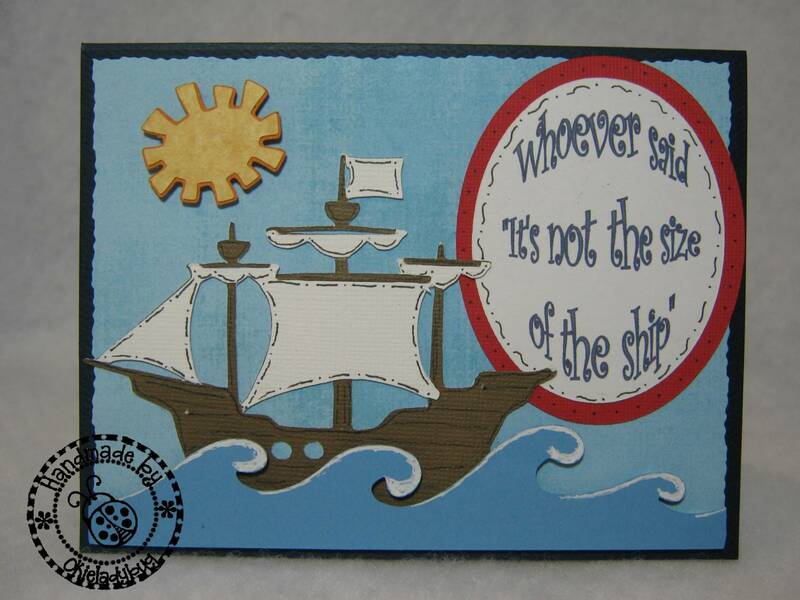 Anyway Trinity was talking of this on the MB and I told her I was posting a card for her husband! *okie thinks Trinity's husband won't be a fan anymore after today*. I came up with the sentiment for the outside and inside of the card. I do remember that I used Paperdoll Dress Up for the boat and I honestly have no idea what the sun or waves are from. I used a white gel pen to add the white caps to the waves. I don't remember what the sailboat was from, but it was perfect for the inside of the card. I used MSword to do the sentiment on the front and the inside of the card. I did pop dot the waves away from the boat and it gave it a nice look. I found this card on Friday when I was doing the reorganization of my drawers *okie wonders how many people are laughing thinking about okie organizing underpants* in my Ikea Expedit unit and couldn't ever remember post it before. So I hope you enjoyed a old but new card! Okie - I absolutely love this card!! Can i steal this idea? I have a certain someone that this would be perfect for!!!! I love it...that's a good one lol! And he's woopin himself over this one. He said he just likes your naughty cards that you do and he's still a fan of them haha. I remember this card. Love it and as far as I'm concerned the naughtier the better! LOL! I LOVE it!!! I usually struggle so much to make a car for the men... This is PERFECT.. I love the humour!! Love the design, great job. Wish there were more of these funny ones around. I had the pleasure of seeing some of your naughty cards at Monique's Crop for the Cure yesterday. Many ladies had a little snicker of them! You are so funny!!! bwahahahahaha! That made my morning! So, glad I checked before making the drive into work where they will likely drive me crazy all day today (I only physically "go in" once a month). 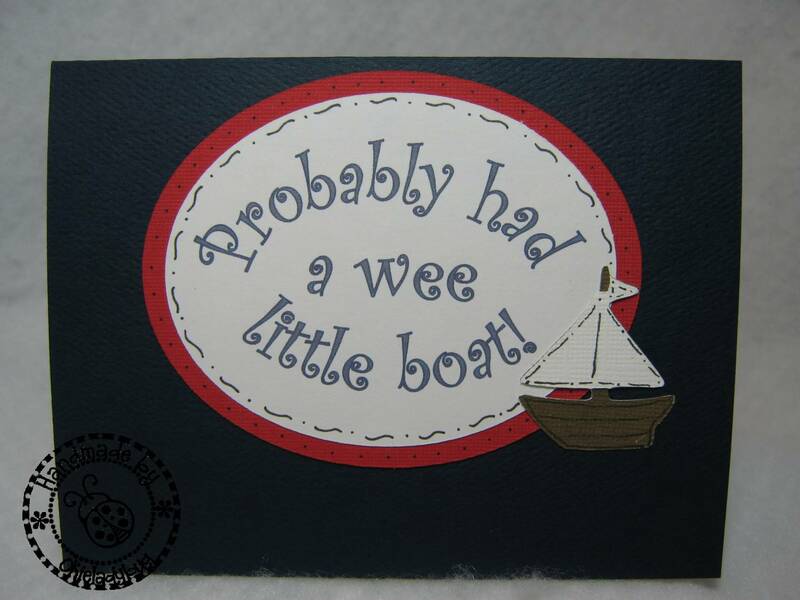 Great card, I'm thinking it would work well with a wobble thingy too :D.
Too hilarious...I confess my favs are your naughty cards!! OK, that's fantastic!! I love your "adult" sentiment cards - they are a HOOT! That is great - love it! Very clever sentiment. You're good, Okie! And from others' comments, it appears you make more of these kinds of cards. Please...bring 'em on. I want to see more! LOL! I love that card! Really really funny! 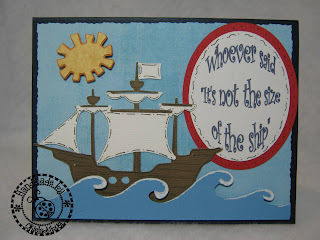 Sun is from Doodlecharms and the sailboat is from Paper Doll Dressup. Not sure about the waves though. I would post something here .. but I am too busy laffin!!! Ok ... now let's forget about that boat ... I wanna see the sailor! Oh this is why I love you Okie! Yours is the blog I keep checking in on! You always make me laugh. One day our paths are going to cross since I live in Oklahoma also. I swear I'm going to give you a big hug when that happens. Your probably going to say who is this crazy lady. But I don't care because I say that about you all the time!!!! Love you for bringing humor into my life! Okie, I remember this card! Brings back memories of the good ol' days on the mb...how fun! I got a chuckle out of it now just as before...TFS! Too funny! Thanks for the laugh. Great card! omg I am laughing so hard. This is why I love your blog. It is so on the "edge" and that's just how I think. I may look proper on the outside but I think like a sailor on the inside. Your fellow shipmate on the cruise. you got a good laugh outta me! did ya hear it? i never seen that sailboat. will have to dig out that cart. thanks. Fathers Day is coming up.....LOL...I'm gonna scraplift this....KEEP 'EM COMING!!! Love it! I love your naughty cards. Especially your naughty princess series! Bent over laughing and wheezing for breath! Too darn funny - so glad you were reorganizing your undies - - err drawers!